If you aren’t ready to use the new Block editor introduced in WordPress 5.0, don’t worry, you can still use the WordPress Classic Editor to edit your content. 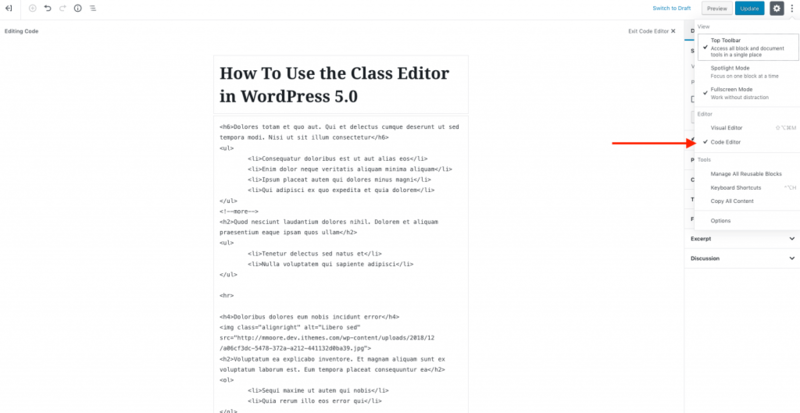 In this post, we are going to show you how to use the Classic Editor in WordPress 5.0. After updating to WordPress 5.0, you will notice that the new default editor for posts and pages has changed from the Classic Editor to a new Block-style editor. 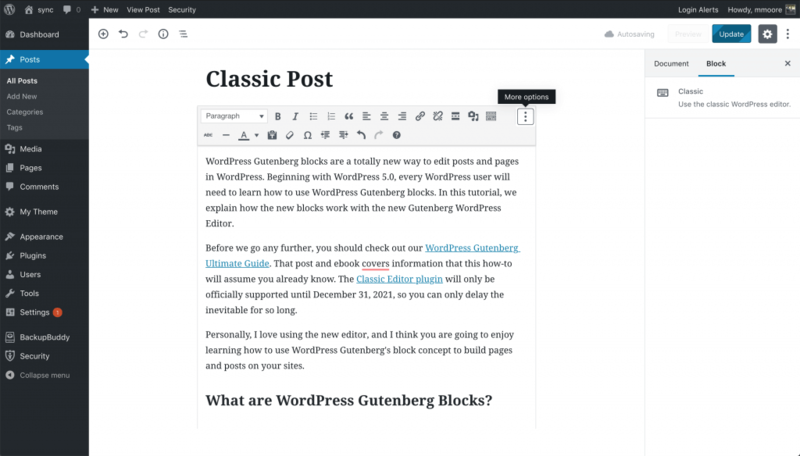 The Block Editor (called the WordPress Gutenberg Editor) is an entirely new way to edit posts and page content in WordPress. Rather than a single WYSIWYG (What You See is What You Get) composition area, page content is divided into “blocks” that have individual settings and editable regions. 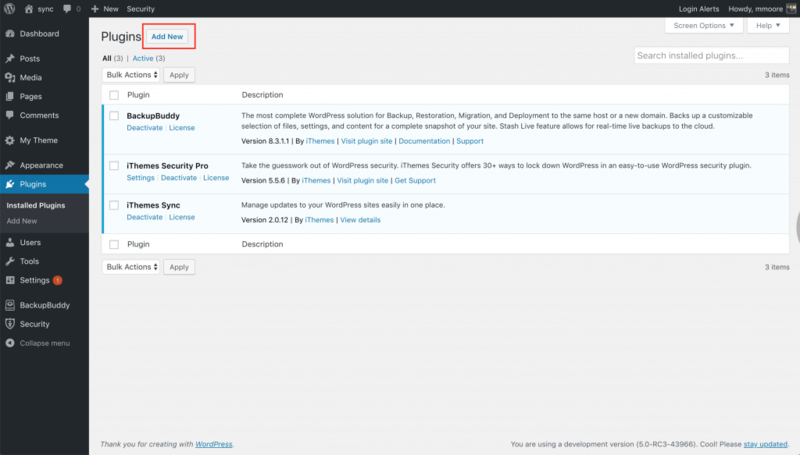 If you haven’t already updated to WordPress 5.0, be sure to check out our How to Update to WordPress 5.0 checklist. The WordPress Block Editor introduced in 5.0 includes a built-in Classic Block as one of the block options you can add when composing a post or page. The Classic Block allows you to use the Classic Editor in the new block system. The Classic block is essentially the familiar WordPress WYSIWYG editor crammed into a block. To use the Classic Block, click the Add Block button, then type classic in the search field and finally click Classic option to add the block into your post or page. You can edit the content in the Classic Block just like if you were using the classic editor. Note: If you used the text editor in your workflow, you will now perform those tasks in the new Code Editor. To access the Code Editor, click the three vertical dots in the top right corner the page to show the more tools and options menu. The more tools and options menu will have options to switch between the visual and code editors. You can also toggle between the visual and code editors using a shortcode. After updating to WordPress 5.0, be sure to also check out this post: How to Convert Existing WordPress Posts to Gutenberg Blocks. If you want nothing to do with the new WordPress Block Editor, you can install the Classic Editor Plugin. ou will find the Classic Editor in the WordPress.org plugin repository as a free plugin download. To install any new plugin from the WP.org repository, click the Add New button. Clicking the Add New button will take you to the Feature Plugins page. The Classic Editor is currently on the Featured Plugins page, but if you don’t see the plugin, you can use the search field to find it. Once you find the Classic Editor plugin click the Install Now button. Once the plugin is finished installing click the Activate button to begin using the Classic editor in WordPress 5.0. After you have installed and activated the Classic Editor plugin, the WordPress editor will be the same as it was in the WordPress version 4.9.8. As you can see, with the Classic Editor plugin, you’ll be able to compose and edit posts and pages in WordPress as before. Using the Classic Editor may be a great way to keep a site usable for clients until you have time to train them on the new WordPress 5.0 Editor. 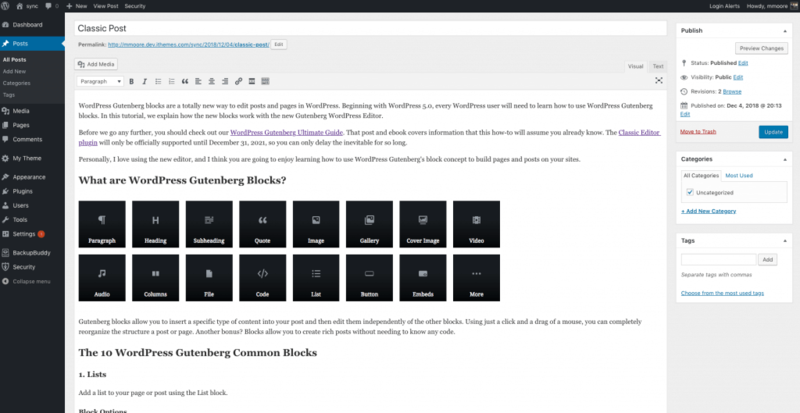 While you do not currently have to learn how to use the new WordPress Gutenberg Blocks, you will eventually need to. 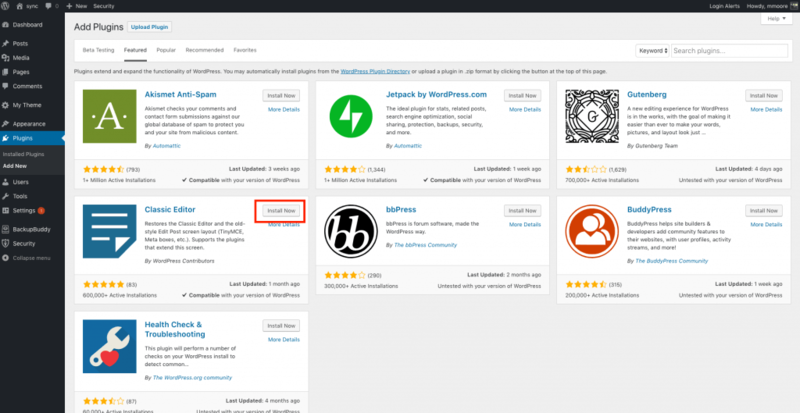 The WordPress team will keep supporting the Classic Editor plugin until the end of 2012. But, starting in 2022, the new Block Editor will be the only editor officially supported by WordPress. Change can be hard, but we have you covered! Check out our Gutenberg Help page. I have noticed that a lot of themes with alternate post types still use the classic editor. Although I currently prefer the classic editor, this is still bothersome. For example, if I use Easy Digital Downloads, the page and post editor is Gutenberg, but the downloads editor is the classic editor. Going back and forth in the same website is not acceptable, and considering standard Gutenberg is more difficult to use, and offers no benefit, I’ll stick with the classic editor. I think the future of Gutenberg is going to be awesome! The new Security Dashboard in iThemes Security wouldn’t have been possible without Gutenberg. It is clear that it isn’t a finished project but just like you I am excited about the potential.